I know it’s not a accident, I do hope for the new comers and the vets sake, that they deliberately work on it. Just make it happen. Forgive me if I’m off the mark here - I haven’t owned an Elektron product before and I don’t have an M:S yet, but having watched a lot of tutorial and demo videos I think I have a work around in mind for the lack of WAVE parameter-lock a.k.a. sample-lock. Obviously this isn’t ideal and it’s a bit fiddly, but some of the best music is made when we have to make do and come up with clever work around, right? If you can plan ahead an know that you want to use, let’s say, 6 samples on a given track. On the computer you can concatenate all 6 samples into a longer waveform. One sample after the other, perhaps leaving a short gap between them. Then on the M:S you choose this super-sample for the track and use the Sample Start and Sample Length parameters to select the chunk of the sample you wish to play. 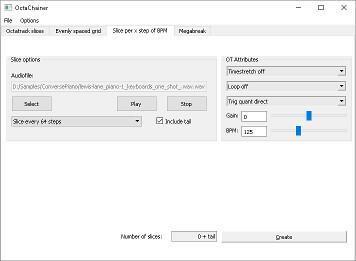 That way you can parameter-lock Sample-start and Sample-length on a trigger by trigger basis to effectively change the sample being played. I can’t be 100% sure it’ll work, and I know it’s fiddly and frustrating, but maybe it’s a workaround that will help? OctaChainer is a Windows and OS X tool for creating sample chains and slice data for the Elektron Octatrack and Analog Rytm.